BBC presenters Jonathan Ross and Russell Brand have been suspended by the BBC following the row over their prank phone calls to Fawlty Towers actor Andrew Sachs on Radio 2. Both men have apologised to Sachs for their comments, and Brand has resigned from his Radio 2 show. Here are their apologies in full. I have apologised to Andrew Sachs for the rude messages I left on October 18 and he has graciously accepted. As I only do the radio show to make people laugh I've decided that given the subsequent coverage I will stop doing the show. 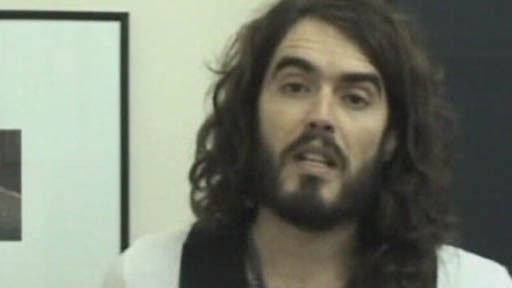 Russell Brand: 'It was a really stupid thing to do"
I've loved working for the BBC and am very proud of the shows myself, Matt Morgan, Nic Philps, Mr Gee and Noel Gallagher have made and I apologise to all of them for damaging their careers - except Noel, whose band are doing quite well. I got a bit caught up in the moment and forgot that at the core of the rude comments and silly songs were the real feelings of a beloved and brilliant comic actor and a very sweet and big hearted young woman. Apologies are also owed to the loyal listeners of the show who enjoyed its shambolic spirit and anarchy and will be upset that it cannot continue. I take complete responsibility and offer nothing but love and contrition and I hope that now Jonathan and the BBC will endure less forensic wrath. I am deeply sorry and greatly regret the upset and distress that my juvenile and thoughtless remarks on the Russell Brand show have caused. I have not issued a statement previously because it was my intention and desire to offer an apology to all those offended on my Friday night programme. However, it was a stupid error of judgement on my part, and I offer a full apology.